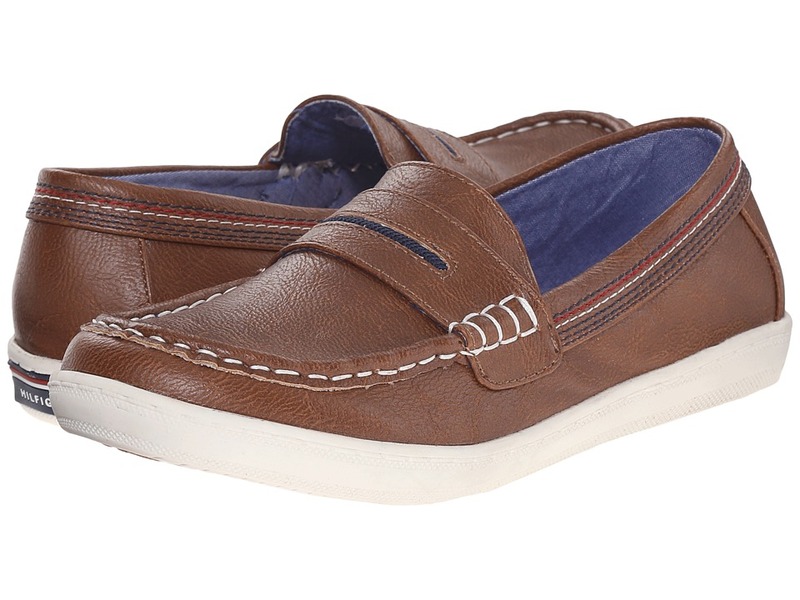 Handsome and classic, these Tommy Hilfiger&amp#174 Kids boat shoes are the perfect way to add some just-like-dad style to his wardrobe. Synthetic leather upper with bold contrast stitching and decorative lacing. Slip-on design for quick and easy on and off. Breathable textile lining and a cushioned textile footbed. Durable rubber outsole. Imported. Measurements: Heel Height: 1 2 in Weight: 6 oz Product measurements were taken using size 2 Little Kid, width M. Please note that measurements may vary by size. Weight of footwear is based on a single item, not a pair. 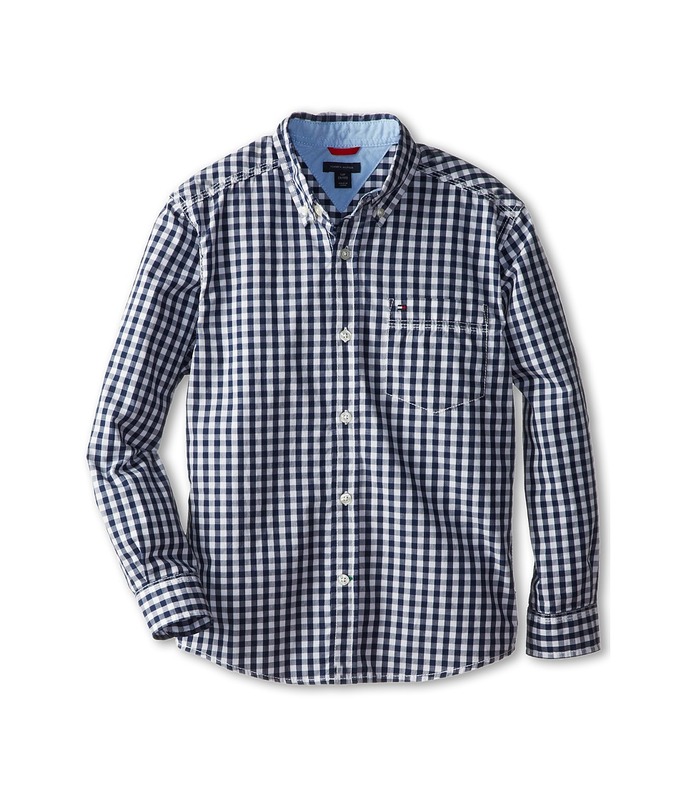 Dress him to impress in the Tommy Hilfiger Classic Woven Shirt. Woven cotton fabrication in a clean solid. Button-down collar. Full button-up front closure. Long sleeves with buttoned cuffs. Logo embroidered patch pocket at left chest. Shirttail hem. 100 percent cotton. Machine wash cold, line dry. Imported. Measurements: Length: 22 in Product measurements were taken using size MD (12-14 Big Kids). Please note that measurements may vary by size. 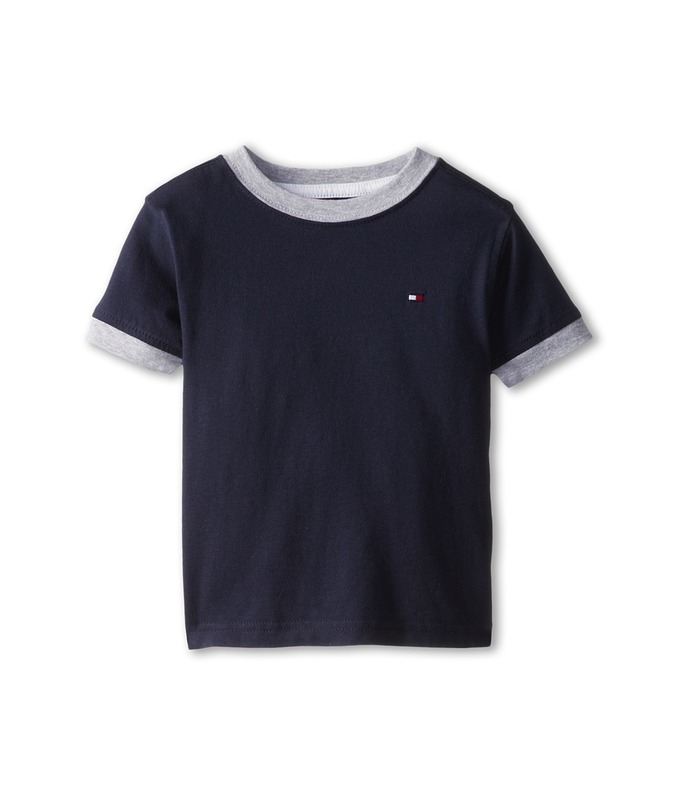 Keep the little one looking dapper with the Vineyard End On End Shirt from Tommy Hilfiger Kids. 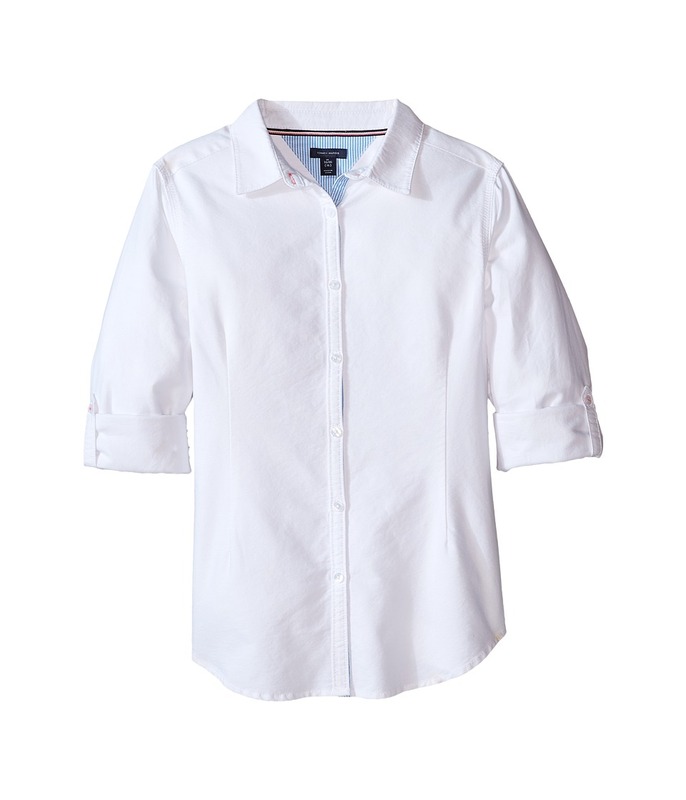 Button-down collar is lined with striped cotton. Button-front closure. Chest pocket with flag logo. Long sleeves with button cuffs. Shirttail hem. 100 percent cotton. Machine wash warm, tumble dry medium. Imported. Measurements: Length: 16 in Product measurements were taken using size 2T Toddler. Please note that measurements may vary by size. 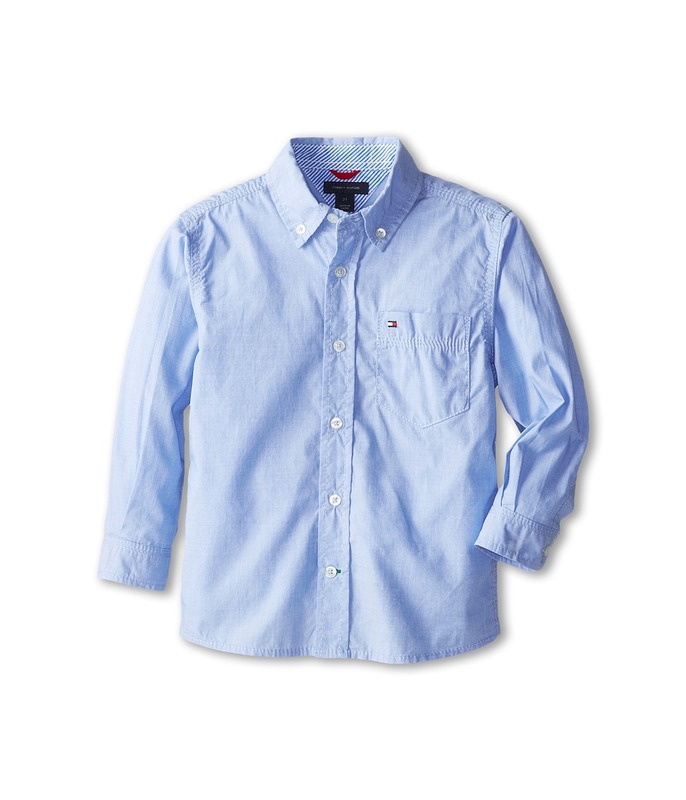 Dress him to impress in the Tommy Hilfiger Kids Vineyard Shirt. Woven-cotton chambray shirt. Button-down collar. Full button-up front closure. Long sleeves with buttoned cuffs. Logo embroidered patch pocket at left chest. Shirttail hem. 100 percent cotton. Machine wash cold, line dry. Imported. Measurements: Length: 25 in Product measurements were taken using size MD (12-14 Big Kids). Please note that measurements may vary by size. 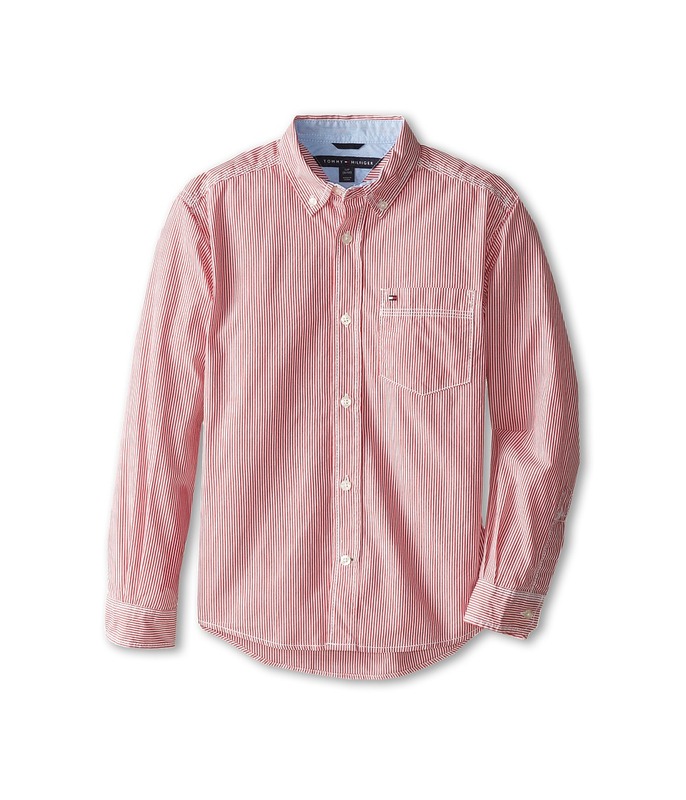 Dress him to impress in the Tommy Hilfiger Kids Stripe Shirt. Woven cotton fabrication covered in fine stripes. Button-down collar. Full button-up front closure. Long sleeves with buttoned cuffs. Logo embroidered patch pocket at left chest. Shirttail hem. 100 percent cotton. Machine wash warm, line dry. Imported. Measurements: Length: 22 in Product measurements were taken using size MD (10-12 Big Kids). Please note that measurements may vary by size. 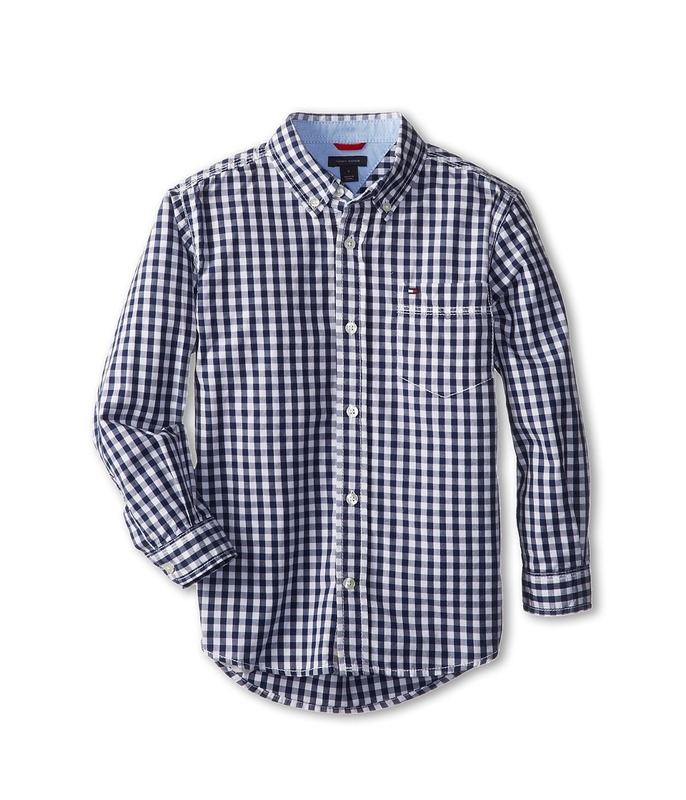 Dress him to impress in the Tommy Hilfiger Baxter Woven Shirt. Woven cotton fabrication covered in gingham plaid. Button-down collar. Full button-up front closure. Long sleeves with buttoned cuffs. Logo embroidered patch pocket at left chest. Shirttail hem. 100 percent cotton. Machine wash cold, line dry. Imported. Measurements: Length: 16 in Product measurements were taken using size 2T Toddler. Please note that measurements may vary by size. 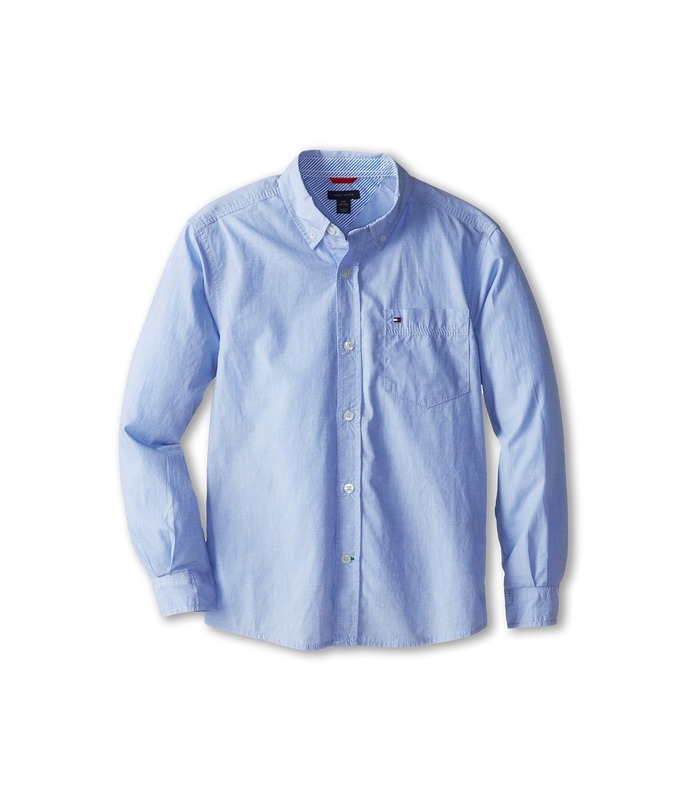 Dress him to impress in the Tommy Hilfiger Kids Baxter Woven Shirt. Woven cotton fabrication covered in a boxed plaid. Button-down collar. Full button-up front closure. Long sleeves with buttoned cuffs. Logo embroidered patch pocket at left chest. Shirttail hem. 100 percent cotton. Machine wash cold, line dry. Imported. Measurements: Length: 21 in Product measurements were taken using size SM (8-10 Big Kids). Please note that measurements may vary by size. Soft, simple and stylish. The Ken Tee will keep the kiddo in style for all occasions. Ribbed crew neck and sleeve cuffs. Short sleeves. Straight hemline. Tiny flag logo at left chest. 100 percent cotton. Machine wash cold, tumble dry low. Imported. Measurements: Length: 15 in Product measurements were taken using size 2T Toddler. Please note that measurements may vary by size. Soft, simple and stylish. 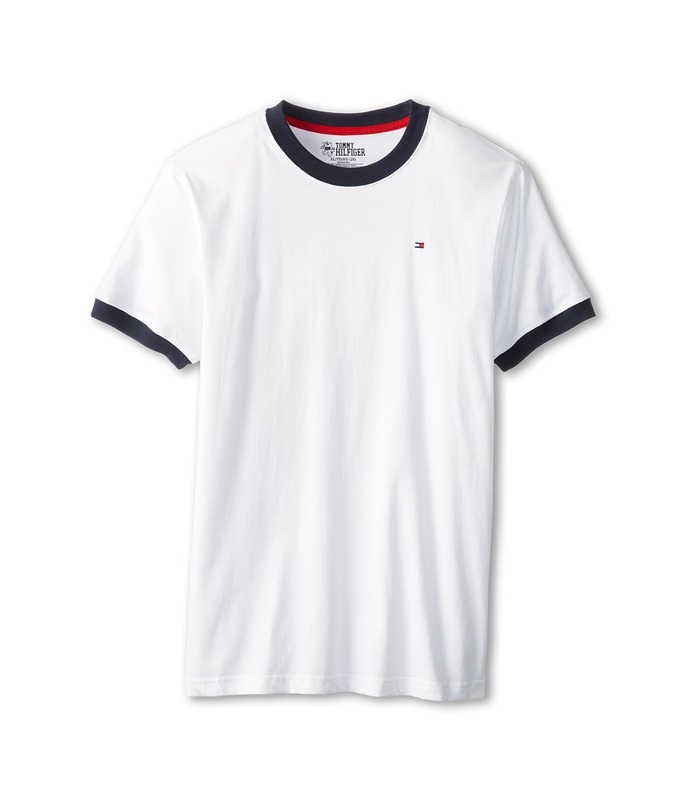 The Ken Tee will keep you in style for all occasions. Soft cotton tee is soft to the touch for an all-day comfort. Ribbed crew neck and sleeve cuffs. Short sleeves. Straight hemline. Tiny flag logo at left chest. 100 percent cotton. Machine wash cold, tumble dry low. Imported. Measurements: Length: 22 in Product measurements were taken using size SM (8-10 Big Kids). Please note that measurements may vary by size. The durable Back Country Cargo Shorts, by Tommy Hilfiger can take on whatever he can dish out. 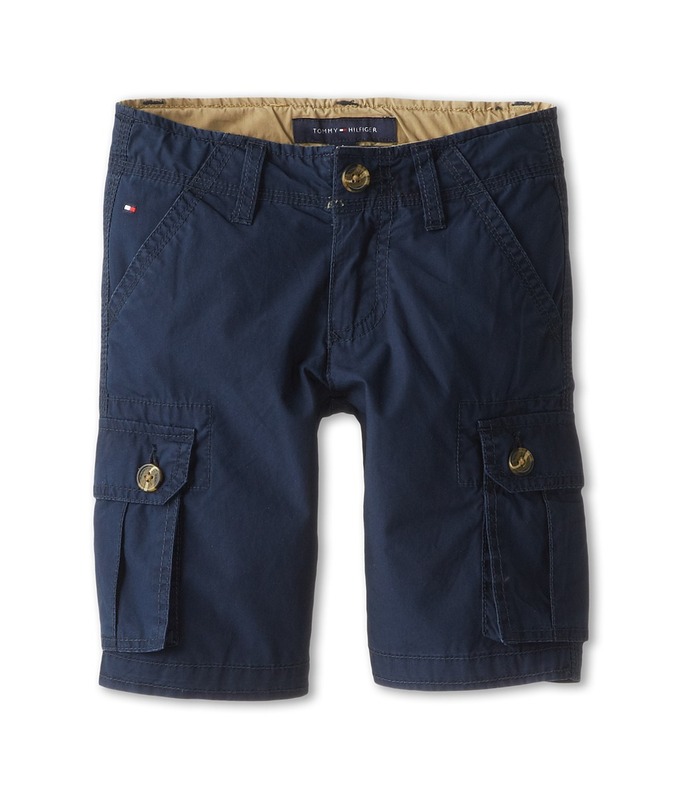 Cotton cargo shorts feature wood-toned buttons and Tommy Hilfiger logo embroidery. Tone-on-tone topstitching throughout. Contrast interior lining on the fitted waistband. Front slash hand pockets. Double button-flap cargo pockets. Rear button-flap pockets. Zip fly with button closure. Belt loops. Straight hem. 100 percent cotton. Machine wash warm, tumble dry low. Imported. Measurements: Waist Measurement: 22 in Outseam: 14 in Inseam: 7 in Front Rise: 7 in Back Rise: 10 in Leg Opening: 14 in Product measurements were taken using size 4T Toddler. Please note that measurements may vary by size. 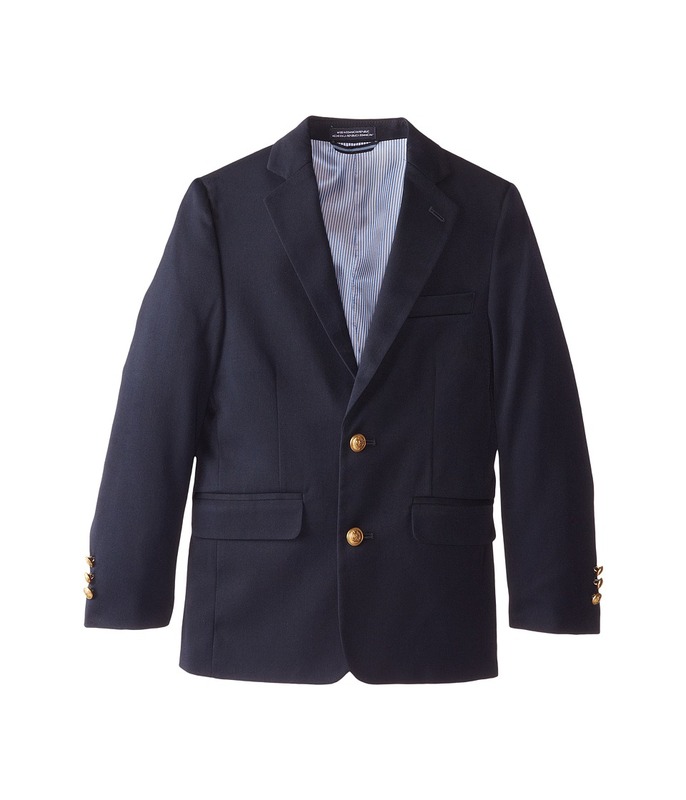 The sleek Tommy Hilfiger Kids Alexander Blazer is the perfect jacket to complement formal slacks for a his next formal, awards ceremony, or dinner. Single-breasted, sharkskin jacket with two-button closure. Notched lapel. 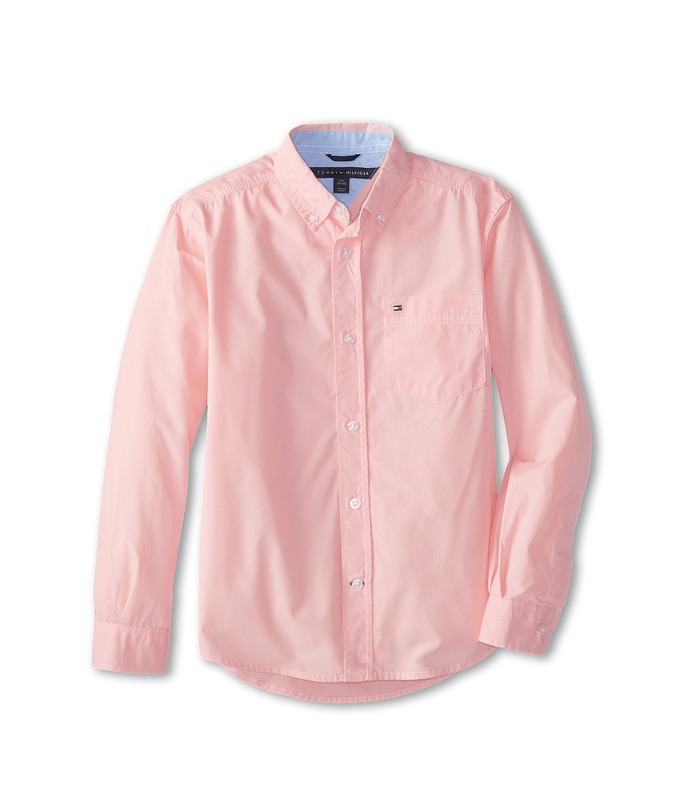 Long sleeves with three-button cuffs. Front flap pockets. Welt chest pocket. Hidden inner pocket. Striped lining for ultimate comfort. 59 percent polyester, 33 percent rayon, 8 percent wool Lining: 100 percent polyester. Dry clean only. Imported. Measurements: Length: 23 in Product measurements were taken using size 12 Big Kids. Please note that measurements may vary by size. He~s so rakish in the Michael Saddle from Tommy Hilfiger Kids! 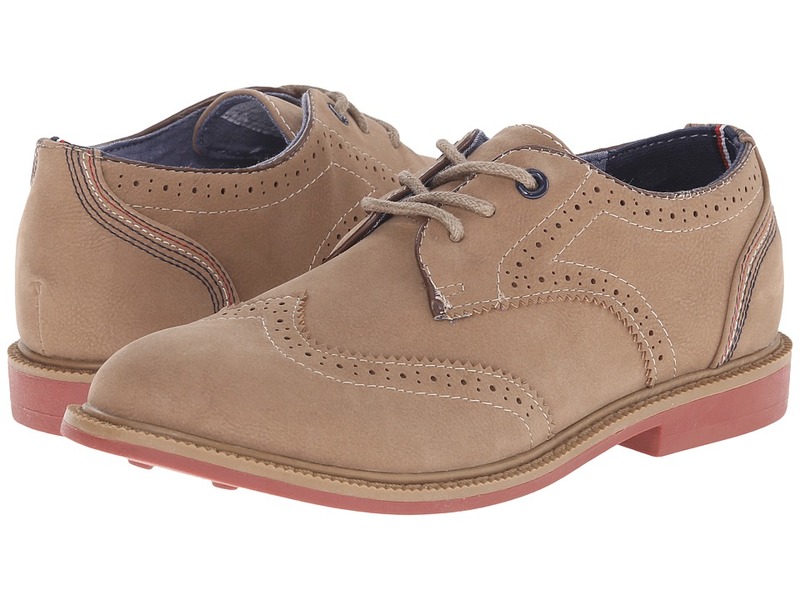 Manmade upper with a saddle overlay and brogue detailing. Lace-up closure. Soft man-made lining. Cushioned footbed. Manmade outsole. Imported. Measurements: Weight: 12 oz Product measurements were taken using size 2 Little Kid, width M. Please note that measurements may vary by size. Weight of footwear is based on a single item, not a pair. He~ll be a striking young lad in the dapper Michael Oxford from Tommy Hilfiger Kids. 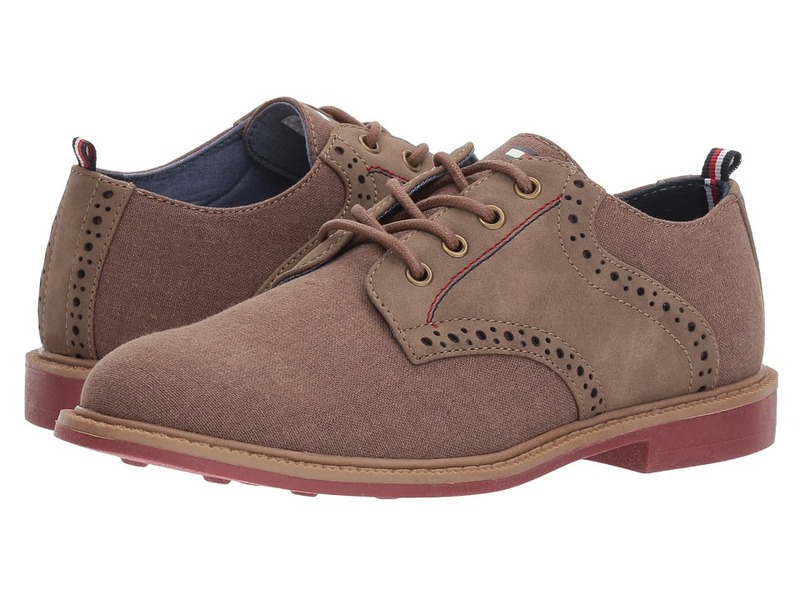 Manmade upper in an oxford silhouette and brogue detailing. Lace-up closure. Soft man-made lining. Cushioned footbed. Manmade outsole. Imported. Measurements: Weight: 13 oz Product measurements were taken using size 2 Little Kid, width M. Please note that measurements may vary by size. Weight of footwear is based on a single item, not a pair. 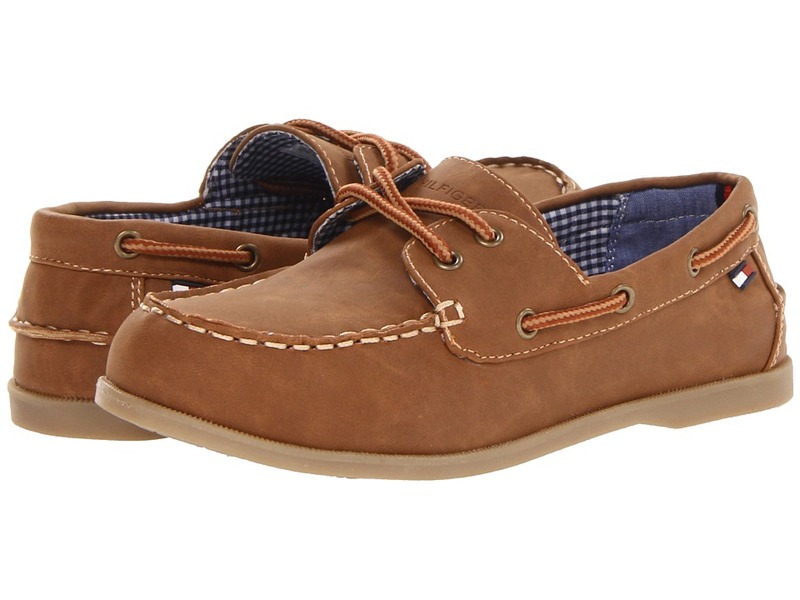 Give him a fresh perspective with his stylish duds in the Dylan Boat Shoe by Tommy Hilfiger&amp#174 Kids. Man-made upper in a penny loafer silhouette. Easy slip-on. Man-made lining. Lightly cushioned footbed. Man-made outsole. Imported. Measurements: Weight: 7 oz Product measurements were taken using size 2 Little Kid, width M. Please note that measurements may vary by size. Weight of footwear is based on a single item, not a pair. He~ll be the star player in the Tommy Hilfiger Kids Matt Polo. 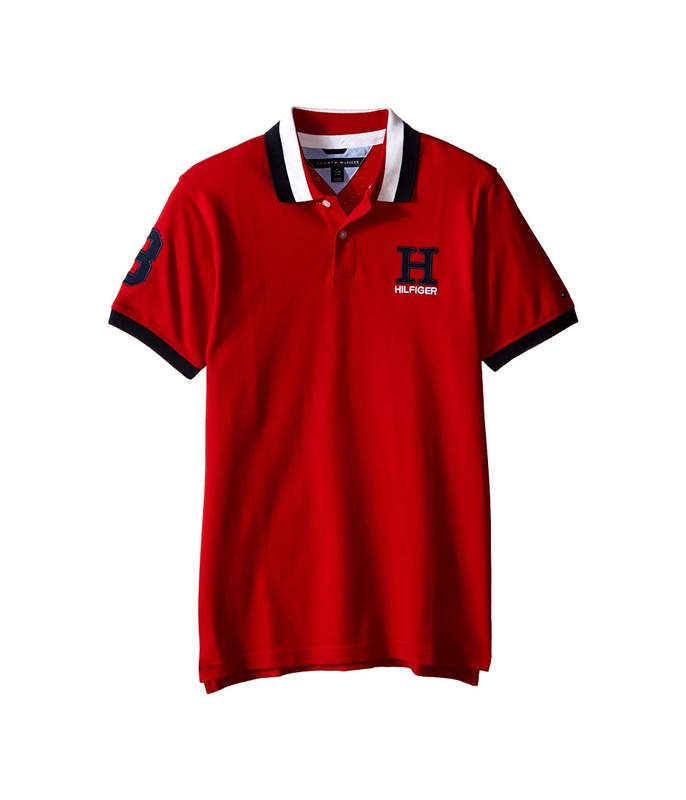 Soft-washed cotton piqu&amp#233 fabric boasts an embroidered logo at left chest and right shoulder. Contrasting ribbed fold over collar. Two-button placket. Short sleeves with ribbed cuffs. Straight hem with side vents. 100 percent cotton. Machine wash cold, tumble dry low. Imported. Measurements: Length: 25 in Product measurements were taken using size MD (10-12 Big Kids). Please note that measurements may vary by size. 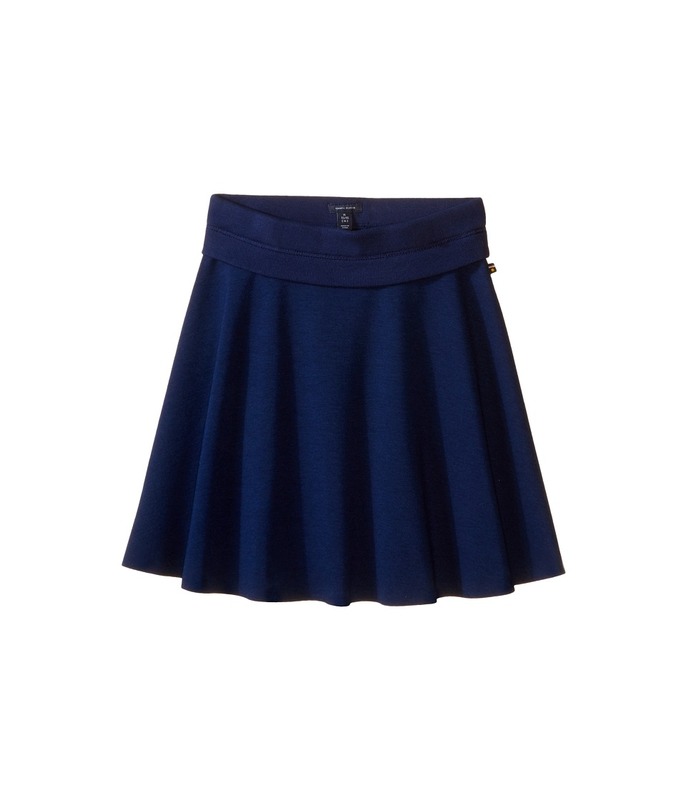 A versatile skirt that~s sure to add style to her trendy wardrobe. Stretch, ponte-knit skirt flaunts a A-line silhouette. Elastic ribbed foldover waistband. Pull-on design. Straight hemline. 76 percent polyester, 20 percent rayon, 4 percent spandex. Machine wash cold, tumble dry low. Imported. Measurements: Skirt Length: 17 in Waist Measurement: 26 in Product measurements were taken using size X-Large (16 Big Kids). Please note that measurements may vary by size. 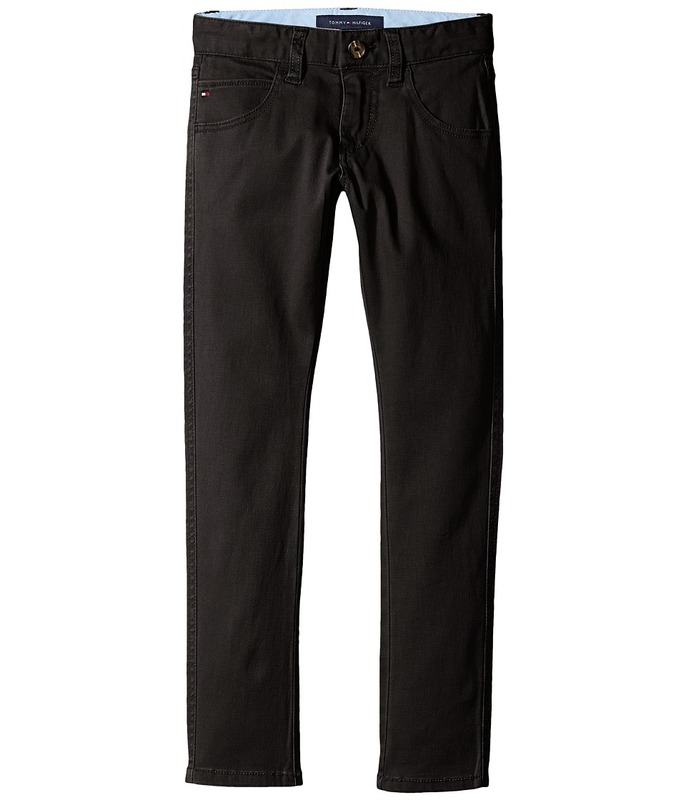 The Tommy Hilfiger Five-Pocket Trent Pants are a style staple. Soft denim pant boasts a skinny fit through the seat, thigh and leg. Resilient denim sports a high stretch for added comfort. Classic, five-pocket design. Belt-loop waistband. Zip fly and button closure. 97 percent cotton, 3 percent spandex. Machine wash cold, tumble dry. Imported. Measurements: Waist Measurement: 28 in Outseam: 36 1 2 in Inseam: 27 1 2 in Front Rise: 9 in Back Rise: 13 1 2 in Leg Opening: 11 in Product measurements were taken using size 16 Big Kids. Please note that measurements may vary by size. A crisp and classic wardrobe staple! Slim-fit oxford shirt crafted from a luxurious cotton fabrication. Princess seaming lends to the feminine silhouette. Point collar. Convertible long sleeves with roll-tab cuffs. Full button-up closure. Shirttail hemline. 100 percent cotton. Machine wash cold, tumble dry low. Imported. Measurements: Length: 24 in Product measurements were taken using size X-Large (16 Big Kids). Please note that measurements may vary by size.